We made it! 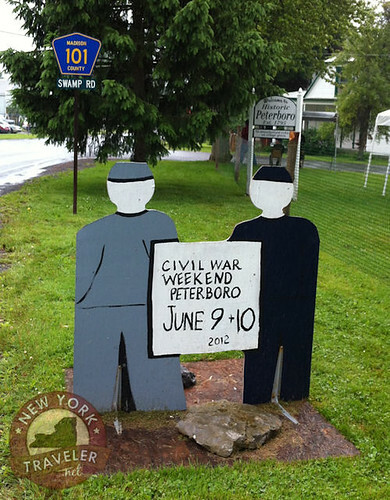 We have been wanting to attend Peterboro’s Civil War Weekend for years because we have always wanted to see a reenactment of battle. We are also very fond admirers of Gerrit Smith (and revivalist Charles G. Finney and the abolition movement, which started in this area). This area of Peterboro is very rich in history. The Gerrit Smith estate in Peterboro was one of the stops of the Underground Railroad (see www.sca-peterboro.org/PeterboroNY.html). The people in the town of Smithfield obviously love history. 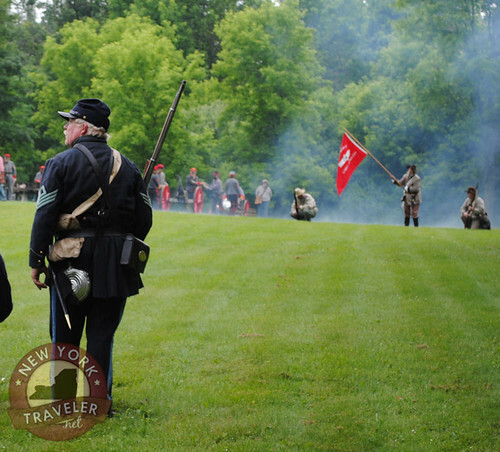 They’ve sponsored the Civil War Weekend for 20 years now, culminating to this year, the 150th anniversary of the Civil War. We wandered the park grounds, visiting the various tents, looking at the displays and chatting with some folks. My son fit right in with the crowd, wearing his Union cap he got a few years ago. 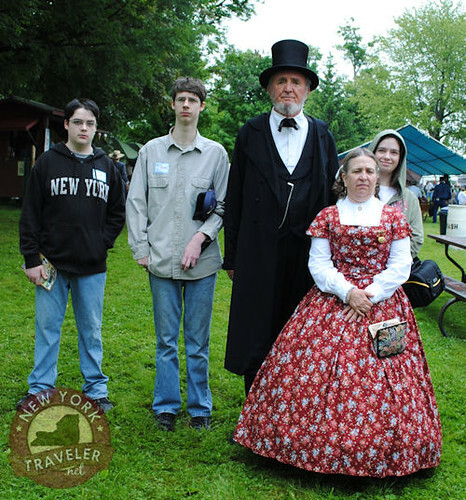 We got to meet Abraham Lincoln and his wife, Mary Todd Lincoln. Very friendly folks. 😉 Abe Lincoln is played by Jack Baylis. 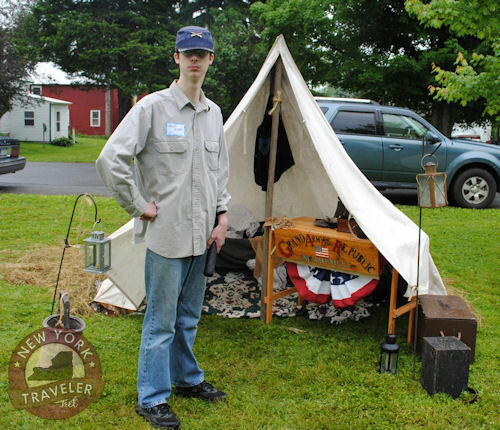 He lives in Central New York, traveling throughout the state and a few others, portraying Abraham Lincoln at various events like these. 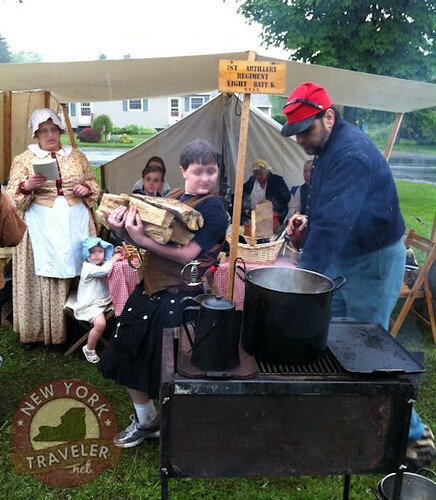 Mary Todd Lincoln is played by Judee Synakowski, another “pro” reenactor. Here are a few of the highlights of our visit. 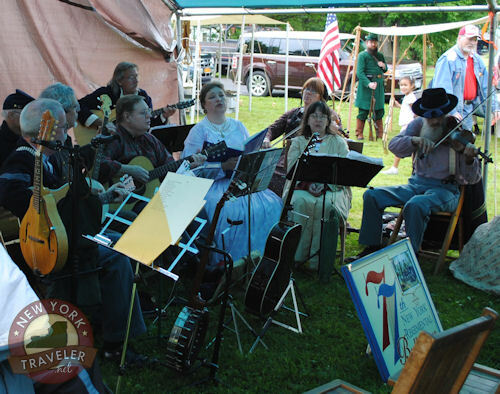 The 77th New York State Regimental Band kept the mood lively with period tunes. The music was wonderful. My son was especially happy to watch someone play the violin. We stopped by a woman working with strange little baseball bats! She said that this was bobbin lace! I’d never heard of it, so she gave a very informative account of the history of lace textiles in the Civil War era. I’ve always had a fascination for textiles. 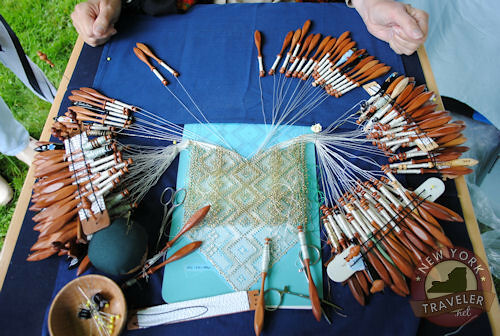 It’s mind-blowing to think that, way back when, all textiles were woven by hand. By the time of the Civil War, many types of fabrics were now machine made, but some of the old handmade techniques were being preserved. Bobbin lacing was almost extinct until a group of ladies revived the craft in the 1970s. The work is amazing. Lot of families were “running” the camps. This young fellow was everywhere, carrying firewood and running errands throughout the camp. 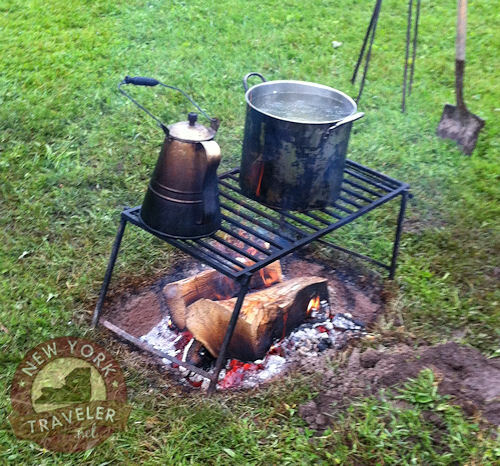 The fire pits were very comforting on this cool, damp day. Despite the rain, the turnout was pretty good for the event. 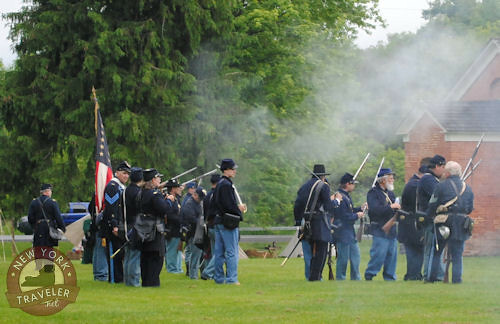 When it was time to gather for the Civil War skirmish, the crowds were thick. The Gray and the Blue were about to face off. I was kind of hoping for some hand-to-hand combat. 😉 None of that, but the marching troops, drums and fife were terrific. 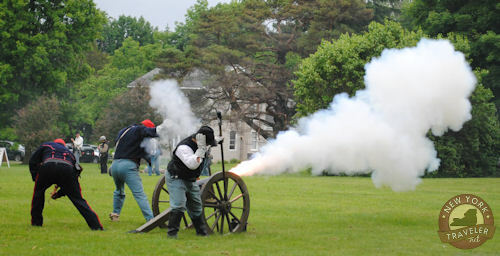 And the cannon fire was very exciting. AND LOUD. I took a brief video of the battle. Notice two unique things in the clip– after the blast of the Confederate cannon, at 19 seconds, you can see the screen waver and lose focus! I suppose the camera was effected by the sound wave that blasted across the field. At 33 seconds, you can see the smoke ring that erupted from the cannon, bringing oooo’s and ahhh’s from the crowd. The skirmish lasted about 30 minutes, at which time the skies broke open and we had a downpour. 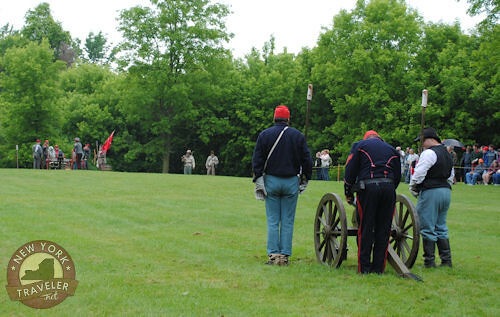 The soldiers made a formation, firing rounds for the “honored dead,” and then dispersed to the succor of their tents. Stay tuned for more of our visit. We walked through the town square, viewing the monuments, and visited Peterboro’s Historical Museum, stop #17 on the Madison County history tour trail!